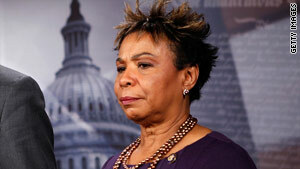 Caucus Chairwoman Rep. Barbara Lee and Rep. Emanuel Cleaver wrote Obama to plead for help for minorities. Washington (CNN) -- Members of the Congressional Black Caucus called on President Obama Friday to address the skyrocketing unemployment rate facing minorities -- especially African-Americans and Latinos -- and greater economic conditions plaguing low-income communities. "Our job is to make sure the legislation that gets to the president's desk responds to the degradation and the crisis in our community," said Rep. Sheila Jackson Lee, D-Texas, at a Friday news conference. "Our community is bleeding. And we are the worst hit." According to the Bureau of Labor Statistics, the unemployment rate in November 2009 for blacks is at 15.6 percent -- and 12.7 percent for Hispanics. In comparison, the rate for whites is 9.3 percent. The latest job numbers show that a drop in the U.S. unemployment rate dropped from 10.2 percent to 10 percent in November. "Our Nation has suffered substantial unemployment and underemployment over a prolonged period, which has imposed significant economic and social costs, particularly in communities of color," the December 9 letter, from Chairwoman Barbara Lee and Rep. Emanuel Cleaver to Obama, stated. "We appreciate your attention to these prescriptive measures and look forward to working with you." House Majority Leader Steny Hoyer, D-Maryland, has said that the jobs programs to date haven't done enough to address the unemployment issue affecting minority communities. "It's self-evident that the efforts to date have not, particularly in the African-American community and other minority communities and among young people -- done the job that needs to be done." As for the president, Chairwoman Lee said in a recent press release that while she praised Obama's concerns about the economy, "much more needs to be done, particularly for those Americans who are hurting most." But she said her caucus remains committed to working with the president and the Democratic leadership to address the "very real economic crisis gripping our nation, which is particularly acute in communities of color." And the Democratic leadership has seemingly taken note. On Thursday, House Speaker Nancy Pelosi indicated that a jobs bill is likely to come up next week that would provide help for struggling small businesses and hard- hit communities and extend unemployment benefits. Pelosi said that while she's unsure whether the House will get it done, it's something that "I would like to see," adding that it's vital for the House to tackle this issue because unemployment benefits will expire at the end of the year. Some reporters at Friday's news conference asked caucus members why the focus is on minorities and not everyone who is struggling. "We're not talking about race. We're talking about hardest hit, where their unemployment rates are the greatest," Lee said. "We're talking about qualified areas of economic hardship, where 20 percent or more of the population is or at below the poverty line and we want at least 10 percent of the resources targeted." Lee's colleague -- Rep. David Scott, D-Georgia -- also reiterated that the CBC's concern isn't "based on the foundation of race," but rather focused on the "foundation of need."